The talk was organised by the lecturers of the module ‘EU Law’ offered to Year 3 students and the International Law and Human Rights Unit of the Centre for Applied Legal Research. Since the beginning of this academic year 2017/2018 third year students on the LLB degree have had the opportunity to listen to a number of internal and external speakers on the issue of Brexit. 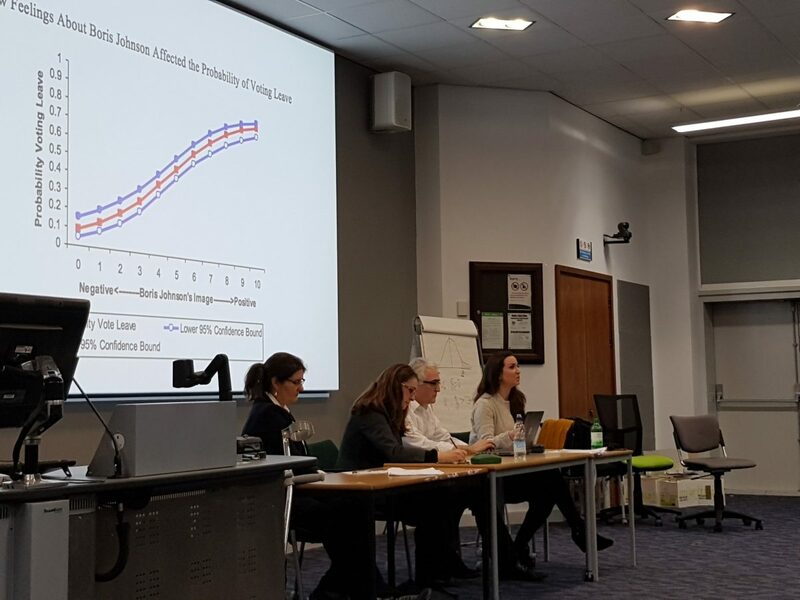 On 16 February 2018 the team teaching EU law convened a panel discussion on ‘Brexit and Trade Relations’ comprised of Christian Dadomo, Senior Lecturer at UWE, Dr Clair Gammage, Lecturer in Law at the University of Bristol, and Dr Maria Garcia, Senior Lecturer in International Political Economy at the University of Bath. Each of them shared his/her thoughts on the topic and the session was then run in a Question Time format as students had been asked to send questions in advance to the chair, Dr Noëlle Quénivet, Associate Professor in International Law. Dr Garcia began the session by setting the scene of the Brexit campaign and Brexit in relation to trade. She pointed out that whilst contestation of trade was a global trend and protests and concerns had been voiced against eg genetically modified organisms, chlorinated chicken, the privatisation of the NHS no such discussion was held during the Brexit campaign. Brexit did not seem to be about contesting global trade and its effects but migration and ‘taking back control’. The fact that there was so little discussion on trade might be explained by the fact that trade negotiations could only be held once the UK had left the EU since the EU has exclusive competence in negotiating trade agreements. Also she explained that if references were made to trade during the campaign it was usually about agreements with other States rather than trade as such. As a matter of fact the best prediction about individuals voting leave/remain was not the trade issue but education, attitude towards migration, etc. In preparation to Brexit trade has been becoming increasingly important as Prime Minister Theresa May referred to it in her Lancaster and Florence speeches and Foreign Minister Boris Johnson talked about it to recently. This has no doubt shifted the debate. Still, no discussion is being had on the contestation of trade policies. Dr Garcia suggested this might be due to the fact that it is too early to do so in light of other significant and more urgent problems. It might also be the case that the government has no clear idea of the precise content of future trade agreements. Moreover the UK government appears to send mixed messages, asking for a seamless trade relationship and yet being unable to adopt a clear position on how to tackled the issue of the two land borders through which it will trade (between Ireland and Northern Ireland and between Gibraltar and Spain). The UK White Paper on Trade reflects an inclusive and pro-development approach to trade that will however be difficult to deliver. Indeed, it appears that at the moment the UK is training individuals on issues relating to financial services rather than goods that are key to trade agreements with development features. Further, if the aim of Brexit is to regain sovereignty why should the UK accept American standards as well as dispute settlement mechanisms enshrined in trade agreements? Dr Garcia explained that it appeared that the UK was in fact anchoring itself in a thinking that supported what Steven Gill has described as the constitutionalisation of a neo-liberal regime through trade agreements. The next speaker, Christian Dadomo, shared his thoughts on what the deep and comprehensive trade agreement favoured by the UK government could look like. Mr Dadomo first explained that before even starting discussions on such an agreement the UK and the EU needed to negotiate and agree on a withdrawal agreement focusing on three priority issues: EU and UK citizens’ rights, a financial settlement and the situation in Northern Ireland. The result of these negotiations were presented in a joint report on 8 December 2017. Such agreement also needs to take into account the future framework arrangements. As Mr Dadomo observed a number of elements are known. First, all free trade agreements the EU has negotiated are different: there is no one, unique solution as it is important that such agreements fit the various interests of the parties. The UK claims that as a soon-to-be former Member State of the EU it already complies with EU law and thus it should not be difficult to agree on such a trade treaty. Any solution between the UK staying a party to the European Economic Area Agreement to the UK applying the World Trade Organisation rules is on the table. On one end of this continuum of solutions is a very close association with the EU. Yet, it is already known that as the UK wants free trade and control over immigration it has expressed its clear wish to leave the Customs Union and the Single Market. Yet, the EU has specified no cherry picking is possible. It is also known that the UK rejects the Norway model as it would mean paying to get access to the Single Market whilst having no say in the law-making process and being obliged to comply with all EU rules, including those on the free movement of persons. On the other end of this spectrum lies the application of WTO rules which is often viewed as the worst scenario possible as it involves the imposition of tariffs on trade and rules of country of origin. In between these two extreme options two types of agreements, modelled on either the EU-Canada Comprehensive Economic and Trade Agreement (CETA) or the EU-Ukraine Deep and Comprehensive Free Trade Area, are available. Mr Dadomo contrasted the two agreements: whilst Ukraine accepts the acquis communautaire, Canada does not; whilst CETA is focused on trade (goods, intellectual property) the agreement with Ukraine also includes provisions relating to security, home affairs and justice. The key problem is that it is still unclear which kind of agreement the UK wishes to have with the EU apart from a ‘deep and comprehensive one’. The possibility of a ‘CETA +++’ has also been formulated. Mr Dadomo stressed that in any case the agreement will have to be bespoke but the possibility to customise some elements also means that conditions can be attached to them. The Swiss model that is highly bespoke is off the table as the EU does not wish further agreements of this type to be negotiated. Mr Dadomo finished his presentation by stating that until the UK clearly specifies what it wishes the agreement to contain it is difficult to provide a legal commentary, ascertaining whether the EU first can legally enter into such an agreement and second would be amenable to conclude such an agreement. Dr Clair Gammage then turned her attention to the impact of Brexit on trade and human rights. She highlighted the complexity of the issue as it covers a variety of legal regimes and political opinions greatly differ on the subject-matter. First, she reminded the audience that the UK is still a member of the World Trade Organisation in its own right but that negotiations at the WTO are undertaken by the EU. Second, she pointed at the lack of understanding of how trade works on a multilateral level and that the lack of expertise in the UK relating to negotiating trade agreements. Indeed, tariffs (of eg agricultural products) are set by the EU in the WTO and these will need to be renegotiated by the UK. Tariff-free trade might be a solution. The UK has submitted a solution to the split between the EU and itself but other WTO members (eg the US) have already voiced their concerns or even opposition to the proposal. Unfortunately for the UK it is not allowed to discuss any trade agreements until it is outside the EU and this is not only due to the exclusive competence of the EU but such negotiations would also violate WTO rules. The WTO recognises two forms of free trade agreements: free trade areas and customs unions, both covering a wide range of treaties which means that the UK is likely to negotiate successful suitable trade agreements with third parties. The problem is time as such treaties take several years to be negotiated and concluded. Another problem faced by the UK relates to the existing free trade agreements between the EU and third parties. Dr Gammage shared her view that there is no automatic roll over for such treaties which means that they would need to be renegotiated. As for trade standards, she explained that the UK will be bound by WTO standards (including those relating to sanitary and phytosanitary regulations) and, should it wish to export its goods to the EU, such goods would need to comply with EU law. Dr Gammage then moved on to discussing the effects of Brexit on human rights, arguing that at first sight it appears that there is no erosion of rights. Yet, the situation relating to Northern Ireland that is regulated by the 1998 Peace Agreement is not entirely clear. Further and more generally, the Charter of Fundamental Rights of the European Union will not apply in the UK anymore. This needs to be given proper consideration as a number of rights enshrined in the Charter are not protected elsewhere (eg in the Convention for the Protection of Human Rights and Fundamental Freedoms) and even though the government is committed to retaining EU law it should be borne in mind that such laws can be changed both by Ministers and Parliament and that devolved administrations might not be involved in such decisions. This will have considerable impact on economic rights but could, as Dr Gammage argued, be included in the withdrawal agreement. Moreover the right to equality does not exist as such in the UK as it is entirely based on EU law. Such a right, different from the prohibition of discrimination based on various factors, could be lost. As for the interrelationship between Brexit, trade and human rights Dr Gammage explained that changes in trade relations should be made with great care as a viable economy is of paramount importance. A further complication relates to accepting, even if reluctantly, trading standards in free trade agreements that might directly impact on the local population. For example, the issue of trade in agricultural products must be carefully thought through as the mass import of agricultural goods may lead to less employment which itself can bring salaries and wages down. Also the UK could be bound by trading standards that apply extra-territorially (eg EU animal welfare rules). Dr Gammage thus suggested it might be better to align UK standards on EU regulations for such matters. However, in the grand scheme, the UK will have to find funds to cover for the lost trade and subsidies to eg agriculture and such funds might in fact be divested from assistance to eg disabled and homeless persons. Dr Gammage concluded on the sad note that the UK will in the long term be vulnerable to internal and external troubles. After the presentations questions from the floor focused on (1) the impact of Brexit on the 1998 Northern Ireland Peace Agreement, (2) the potential checks at the border between the EU and the UK, (3) the impact of Brexit on trade between the UK and South America as well as (3) the future shape of trade agreements between the UK and African States and the Commonwealth.